Studio of 20 m2 in a 19th century building on rue CHAPON in the 3rd arrondissement. 4th floor, no elevator. Security code and intercom. Up to 2 people. The studio has one large window facing the street. Sofabed for 2 people, dining table and 2 chairs. Small kitchen in this room. Separate bathroom with shower. Cable TV & internet connection. Several metro & RER stations in the very neighbourhood. 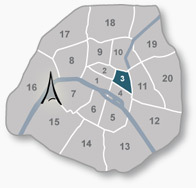 The apartment is situated in Le Marais one of the oldest and most famous neighborhoods of the French capital. Many artists and well-known people has settled in this area to enjoy the chic bohemeian atmosphere. Indeed, many luxious boutiques opens up in Le Marais. Beautiful mansions of the seventeenth century, formerly occupied by noble families. One of the oldest buildings in Paris, the House of Nicolas Flamel, built in 1407, is located 50m from the apartment. Also within 5-10 min walk you wil find the Museum of Arts and Trades, the Museum of Art and History of Judaism, the National Picasso museum, the Cognacq-Jay museum and the museum of the history of France "Carnavalet Museum". All kind of shopping and many restaurants & bars in the neighbourhood. Living room with sofabed for 2 people, dining table, cable TV & internet connection,fan, shelves and a closet. Larges windows facing rue Chapon. Kitchen area with refridgerator, two electric burners, microwave, closets and all kitchen utensils. Tiled bathroom with shower, sink and built-in closets. Separate WC. Apartment on the 3rd floor via stairs. Entrance via a quiet courtyard in Le Marais.